Greywater (aka Graywater) is the waste water from the sinks, showers, tubs, and laundry machines of a home. It can be used to irrigate your landscape, re-used to flush indoor toilets, or to create food & wildlife habitat in a constructed wetland. In our current economy, water has a high value and we pay for it monthly in our water bill. We use water for everything from drinking to cooking, to washing ourselves, our clothes, and our homes, for sewer plumbing, and even to irrigate our lawns and gardens. But once it is used, we don’t have to flush this valuable resource down the drain. Every time we do that, we are literally flushing dollars down the drain. Instead, we can put this resource to work for us in our landscapes and to flush our toilets. By stacking functions with our water, we get many more uses out of it. We can begin to think of water as an essential life resource, instead of a one use commodity. 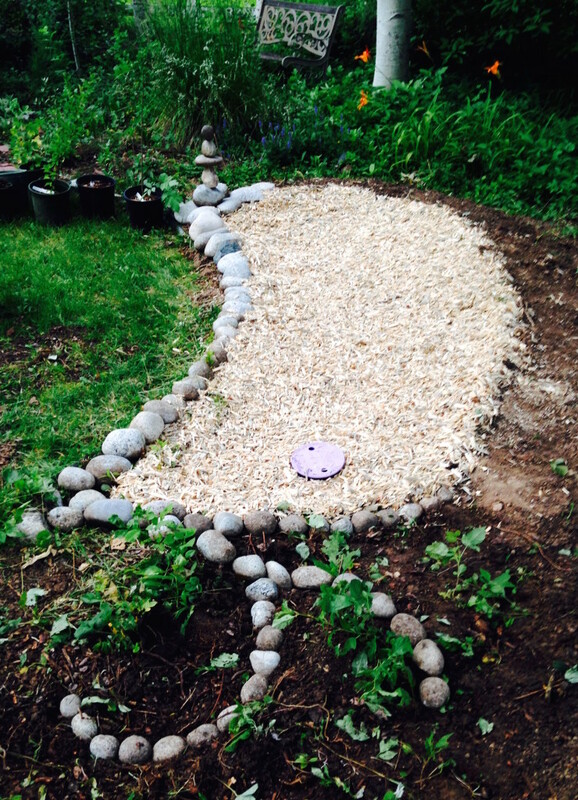 Here at Colorado Greywater, we can help you to transform your patterns of water use. From lo-flow fixtures to landscape irrigation, from constructed wetlands to toilet re-use. Contact us today to see how we can transform your home into a water efficient paradise! We specialize in simple and affordable residential solutions, which add up cumulatively to a large impact on water conservation in Colorado. Our most popular system, the Laundry to Landscape solution is practical and affordable for most urban and suburban sites. It sends laundry water directly to the landscape to provide plants with high quality water, when needed. The Gravity Shower system is our next most popular system as it utilizes the elevation change from your shower to your landscape to supply your plants with water, by simply using gravity. Beyond these simple systems, larger solutions with tanks, filters, and pumps can be installed for a whole house greywater system. These systems can irrigate multiple landscape zones, be used to flush toilets, and be automated to limit maintenance. They can scale from residential to commercial applications and provide deep savings in water consumption for homes, hotels, apartments, office buildings, and beyond. As a result of 2013 legislation, Local stakeholders teamed up with the Colorado Department of Public Health and Environment – Water Quality Control Division to develop Regulation 86: Greywater Control Regulation. In December 2015, the regulation was adopted statewide! Regulation 86 is only one component of a larger legal framework which must be in place for graywater to be used legally in the state. In addition to Regulation 86, the Colorado Plumbing Board has a requirement for greywater piping within structures. Any greywater use will also need to comply with Colorado water rights, which is regulated by the Department of Natural Resources, Division of Water Resources. The 2013 legislation made greywater an opt-in program for local jurisdictions not a statewide program. To allow graywater use, local jurisdictions include a city, city and county, or county will have to adopt an ordinance or resolution to allow graywater use within their jurisdiction by developing a graywater control program that meets the requirements of Regulation 86. Please Contact your Local Jurisdiction to encourage them to adopt a local greywater program without further restrictions! Regulation 86 outlines requirements, prohibitions and standards for greywater use for non-drinking purposes. Allowable greywater use categories are summarized below. Please see Regulation 86 for more detailed information. Note that local requirements may vary.  Design flow of 400gallons per day (gpd) orless.  For outdoor, subsurfaceirrigation within the confines of the legal property boundary.  Design flow of 2,000 gpd or less.  For outdoor, subsurface irrigation within the confines of the legal property boundary .  Design flow of 400 gpdor less.  For indoor toilet andurinal flushing and outdoor, subsurface irrigation within the confines of the legal property boundary.  No maximum flow forindoor use, design flow of 2,000 gpd or less for outdoor irrigation.  For indoor toilet and urinal flushing and outdoor, subsurface irrigation within the confines of the legal property boundary. Regulation 86 outlines design criteria and control measures (aka best management practices) for each category. Please contact your local city or county to discuss local graywater control program requirements. 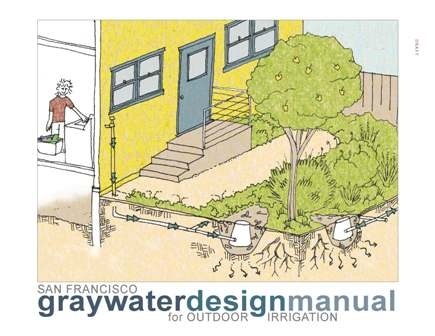 For more information on system types and strategies for implementation, please check out the FREE San Fransisco Graywater Design Manual for Outdoor Irrigation linked below.